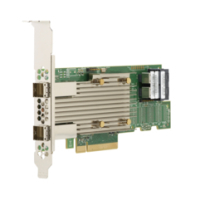 Designed for large-scale external storage enclosures and internal storage, the 9400-8i8e Tri-Mode Storage Adapter is ideal for increased connectivity and maximum performance for data center flexibility. With increased bandwidth and IOPS performance compared to previous generations, the 9400-8i8e adapter delivers the performance and scalability needed by critical applications. * x2 and 24 max NVMe drive support available at a later release.